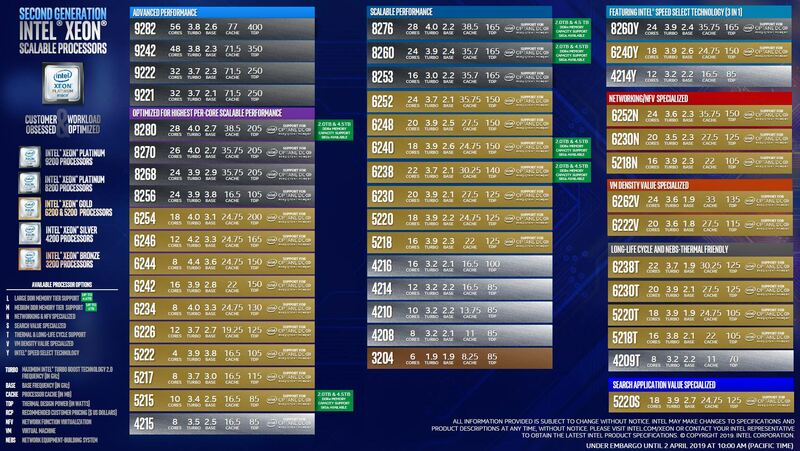 Intel has a large number of SKUs. It believes that its large SKU stack gives customers the flexibility to pick the right SKU for their workload. One will note that there are four Intel Xeon Platinum 9200 series SKUs for the HPC segment. There is a new “Search Application” SKU in the Xeon Gold 5220S. Long-life SKUs still utilize the T suffix. N is for networking. 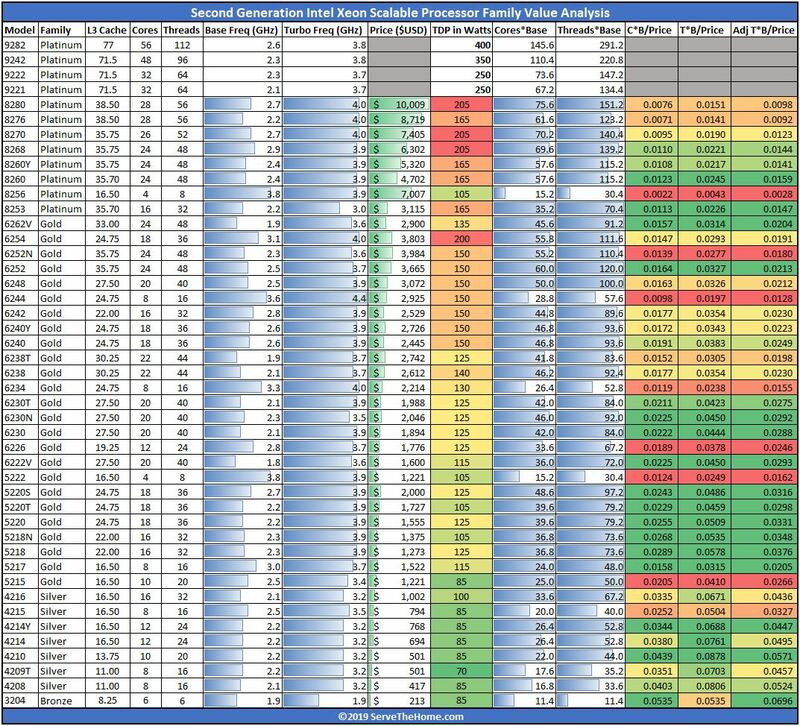 One will also see V SKUs which are higher core count SKUs with lower base clocks for VM density at lower power. Perhaps the most interesting new SKUs are the “Y” SKUs. These are Intel Speed Select Technology parts. 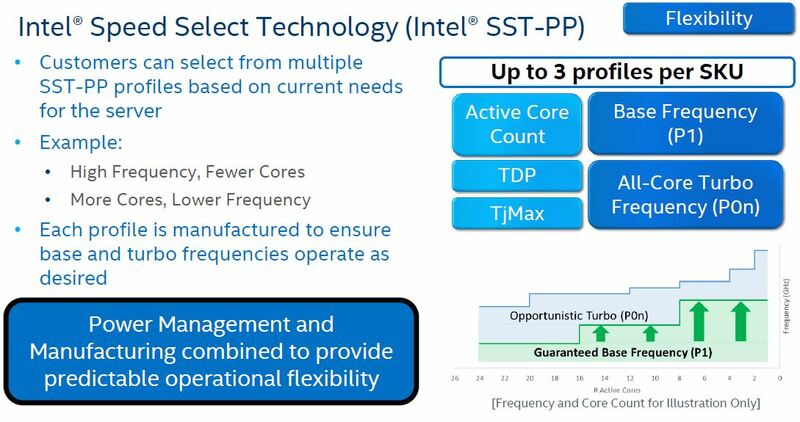 Using the Intel Speed Select Technology, customers can pin workloads to cores and keep other cores at a lower speed. That is interesting, but the SST-PP SKUs are the most interesting. Intel allows the “Y” SKUs to have up to three profiles where CPUs can have more cores active at a lower frequency or fewer cores active at a higher frequency. The core count and clock speeds can be changed through a BIOS switch and a reboot. 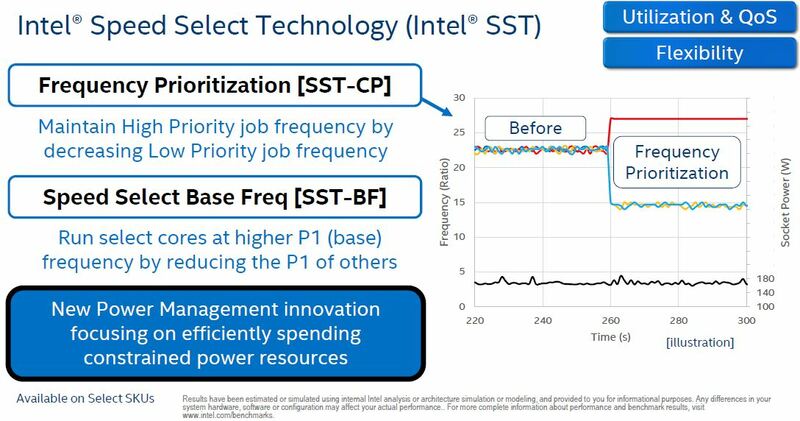 Intel’s concept here is that a customer can deploy one or all three of these SKUs and then automate the processor configuration through their provisioning systems. The SKUs cost more for this flexibility, but customers can install one type of server and potentially reduce the number of SKUs deployed by two thirds. For our readers, we published our customary second generation Intel Xeon Scalable value analysis piece alongside this article. 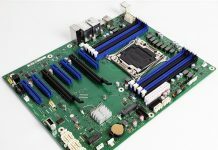 In that article, we show the deltas between the new and previous generation as well as show where one gets the most cores and clock speeds for their dollar in the SKU stack. The key takeaway from that exercise is that from the midrange Intel Xeon Silver line to the midrange Intel Xeon Gold 6100 series, Intel has increased core counts and clock speeds so that many users will see 20-40% performance improvement, at the same price point, using new chips. For some perspective here, the Intel Xeon Silver 4116 jumps from 12 to 16 cores, adding four cores while at the same time increasing base and turbo clock speeds by 200Mhz. That is an absolutely massive increase generation on generation. In our CPU performance section, we are going to focus on what that means in for the popular mid-range SKUs, the Intel Xeon Gold 5220 and Intel Xeon Gold 6230 which saw startling performance increases. While some may point to the top-end Xeon Platinum 8280 as still having 28 cores, at the heart of the market, these are massive gains. Our early testing indicates the Intel Xeon Silver 4216 part is around 36% faster than the Xeon Silver 4116 it supplants. Price remains the same and power is up only 15W. In other terms, if you were on a high-end Intel Xeon E5-2670 infrastructure, the delta is more than enough to let you consolidate three dual-socket servers into two based on cores and closer to two Xeon E5-2670 servers into one Xeon Silver 4116 server based on performance. At the same time-saving power on the remaining servers. This is astounding in a market accustomed to more modest gains. Let us get some sense of what the new performance is. 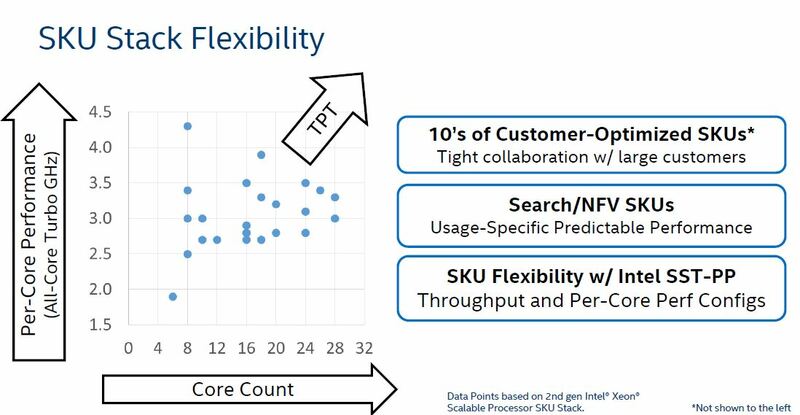 Next, we are going to focus on the core of the SKU stack, but we are also going to show a few results with 7 of the 28 mainstream SKUs.